Hello and welcome to this, the third installment to the Virtual Vegan Potluck! I hope you are having a wonderful time making your way through all the amazing recipes. Each time we do this it gets bigger and bigger and I couldn’t be happier. A huge, huge amount of thanks goes out to Annie, Somer, and Jason for their hard work at putting this event together, not to mention Vegan Bloggers Unite! 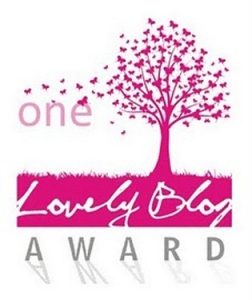 for serving as the host site and the myriad of sponsors who contribute prizes. It may take longer to get through each course but I personally love discovering new bloggers and fun recipes to try. I certainly hope you enjoy my offering and I would love if you kept coming back! My entry this year is a pizza inspired by a recipe from Meatless, by Martha Stewart Living. The book is full of wonderful vegetarian recipes, many that are vegan or can easily be veganized. One of those recipes is the Brussels Sprout and Lemon pizza, an easy dish that features crispy sprout leaves and tart slices of lemon on top of fresh mozzarella cheese. It’s cooked in a cast-iron skillet so there’s no stress about having a funny-shaped pizza. I liked the sound of it, minus the mozz, of course. The first time I made it the cheese was easily replaced with Teese and the result was a light, but filling meal. It paired wonderfully with a crisp white wine. Then Robert and I wondered what could make it better. He was a little adverse to the slices of lemon, though I didn’t mind them. He suggested I toss the sprout leaves in maple syrup (maple roasted Brussels sprouts being one of his most favorite foods) to add a bit of sweetness. I concurred; a touch of sweetness can elevate a dish to a whole new level. Then I thought about adding some heat in the way of a jalapeno. The result was good, if not entirely what I was hoping for. The sprouts were perfectly flavored by the syrup, but the lemon became too assertive and the jalapeno was lost in it all. As with any good experiment I went back to the drawing board. 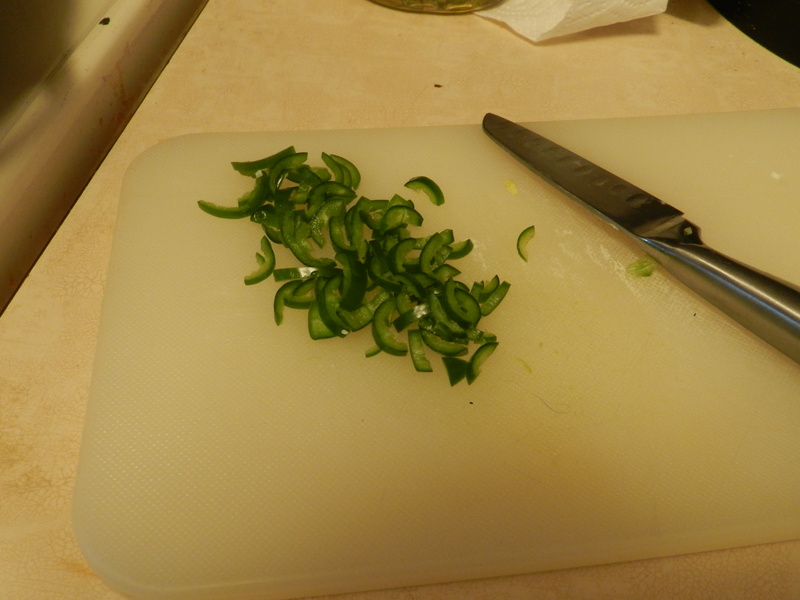 A spicier pepper was definitely needed and I wanted to tone down the lemon flavor without removing it all together. I used two Serrano chilies in place of the jalapeno and instead of lemon slices baked on the pizza I added a bit of lemon zest and juice right after taking the pizza out of the oven. The third time was the charm and I ended up with a truly unique pizza creation. The spice of the peppers matched the sweetness of the sprouts and the lemon zest and juice added brightness and acidity without being overpowering. The subtle creaminess of the Teese rounded it all out. You can certainly stick with jalapenos if you are not a fan of heat or increase the heat with a habanero if you are so inclined. I’m very proud of how this came out as it is the first time I’ve evolved a recipe to make something all my own. I’m usually scared to deviate from a recipe but in this case it really paid off. Remove the dough and let it sit at room temp while you prepare everything else. This will make it easier to stretch and manipulate it in the pan. Preheat the oven to 500 degrees F. Lightly oil the cast iron pan, making sure to brush it up along the sides. Cut the stems off the sprouts and pull as many leaves off as you can. You should end up with roughly 2 cups of leaves. When done, rinse and dry the leaves thoroughly. It is imperative that the leaves are completely dry, or the syrup won’t stick and they won’t get crispy. A salad spinner works well to remove most of the moisture, but you will still need to dry them with paper towels after spinning to get them totally dry. Place dry leaves in a bowl and toss with the maple syrup. Use your hands to make sure every leaf gets coated! Set aside. Clean the serranos and cut them in half. Carefully remove the seeds and membrane, and then slice into thin half-moons. Remember to wash your hands after handling the peppers! Set aside. If you use the Pillsbury crust I did, this part is a little tricky. The dough rolls out in a rectangle and of course the pan is round so you have to do a little cut and paste. 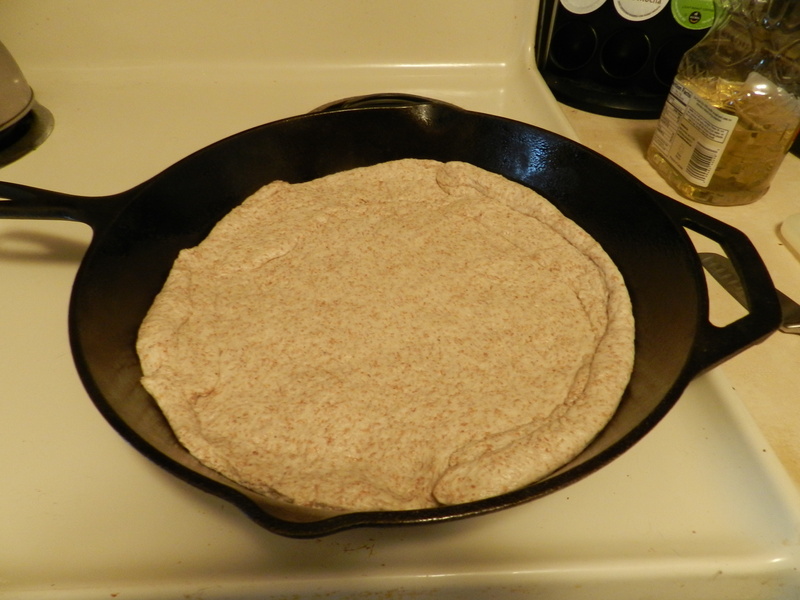 Roll the dough out in the pan then trim the excess that hangs over either side. Use these pieces to fill in the gaps in the pan. This is where having pliable dough comes in handy. Pinch the pieces of dough together then pat it out evenly throughout the pan. 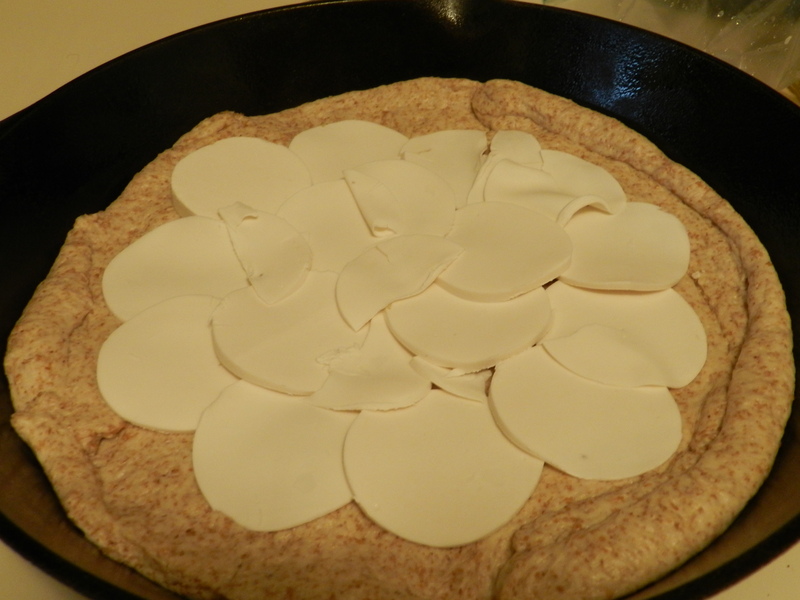 Cut off thin slices of Teese and layer them on the crust, leaving approximately a half inch edge of dough. I using shredded cheese just sprinkle it evenly around, again leaving a half inch edge. Evenly spread the Brussels sprouts on top of the cheese then sprinkle the chilies on top. Place in the oven and cook for approximately 10-12 minutes or until the leaves are crisp and the dough is cooked through. Remove from the oven and evenly distribute the zest and juice on top. My entry will take you to The Road to Serendipity. Seriously, that’s the next blog in the potluck, but I think I might use it to close all my future blog entries; “Now to the Road to Serendipity with you.” It sounds very philosophical 🙂 Now off you go! Yay! Please let me know how you like it! Looks gorgeous and love that combo of serranos and brussels sprouts! Thank you! I love combining sweet and spicy elements in dishes. Love this combo! What a beautiful pizza! What a great use for Brussels sprouts! I love all pizzas, but especially the ones that are ‘a little bit different’! This one looks delicious! What an interesting and incredible pizza! I love all the different flavors and ingredients you chose. I bet it is delicious! What an unusual and amazing combination of flavors! Nicely done, Reia! Thank you so much for participating!! That means a lot coming from someone who’s food creations I dearly admire! PS Sharing God’s Gifts is a no-show. Please link with Poppy’s Patisserie as Hungry Lifetarian also dropped out. Sorry it took so long; I was trying to do all the editing from my phone 😦 Not an easy task! This looks great! and easy too! I love easy; it’s one of my requirements when cooking. Sneaking veggies on Pizza… brilliant! The funny thing is I was neaking them on for my sake, as I’m not a huge fan of eating brussels sprouts whole. I fooled myself! Looks wonderful! 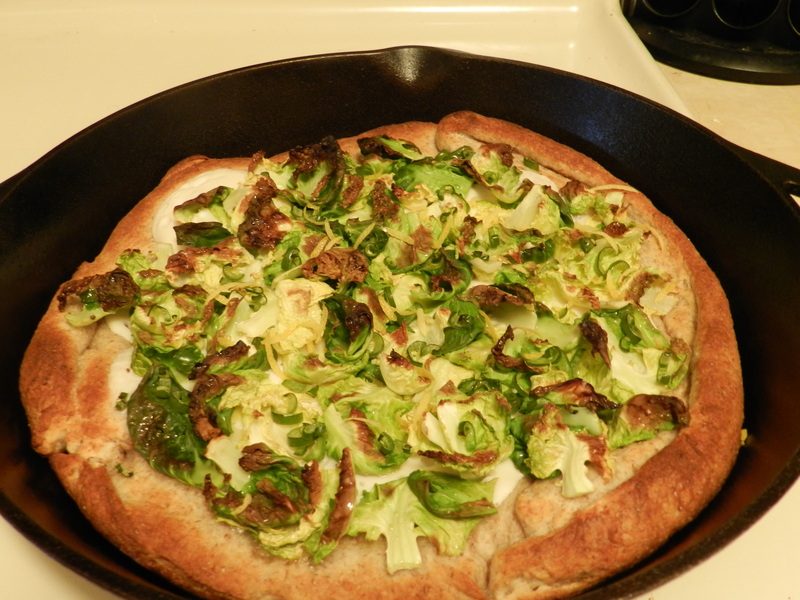 Love the idea of brussel sprouts on a pizza! Happy potluck! Happy potluck Gabby! I’m glad you like it! Ahh super yummy pizzas twice in a row when I’m right in the middle of making pizza! This looks so good and I never thought to put brussel sprouts of pizza! Pizza seemed to be a popular theme this time around. I hope you’ll give this one a try! Just like with sweetness, spice can really add a unique flavor to a dish, can’t it? Thanks for stopping by! 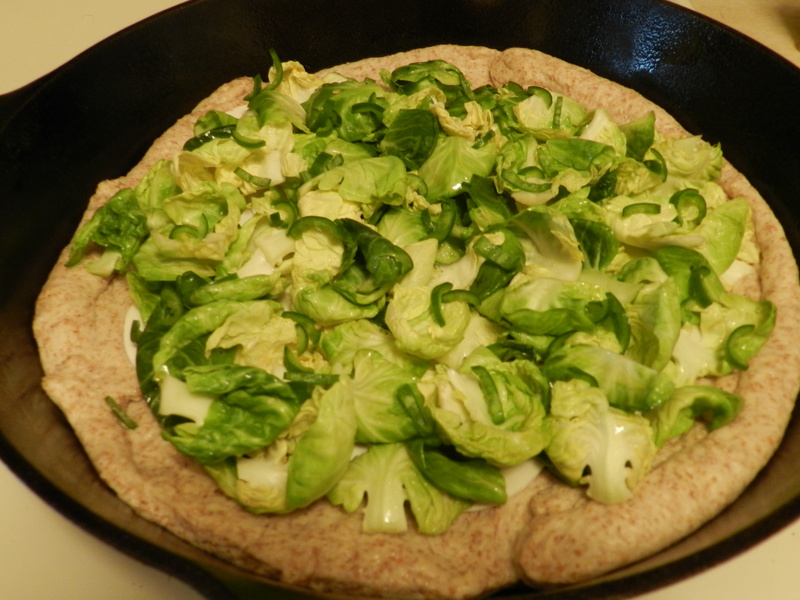 I love brussels sprouts on a pizza.. this is perfect! OHhh I love vegan pizza, it’s one of my favorite things to make. This looks so good. Pizza is so much fun to make, considering her versatile it is. Definitely give this one a try! Fab idea to put Brussels on a pizza 🙂 can’t wait to try this!! It sounds odd, but works well. Please let me know what you think of it if you do try it! Mmmm, get that one in my tummy! I love this pizza! I bought Meatless but nothing had really peaked my interest, it seems I need to take a second look 🙂 I would never have thought to put brussels sprouts on pizza, especially with the spice but that pizza looks delicious, I wish I had it in front of me right now! I don’t think there are a lot of truly unique recipes in there but I do like that the nutrition info is listed, and most of the recipes are fairly simple. If nothing else, it gives rise to inspiration! AH! Brussel sprouts on a pizza. Brilliant! 🙂 I wish I could take 100% credit for it! I love your flavor combination! Sweet, spicy, sour, yum! I never would have put those flavors together on a pizza. I bet it’s amazing. So inspiring! I love this! I have never even thought of adding maple and brussels sprouts to pizza. Mmmmmm. I can always trust that some clever person at the potluck will come up with a crazy combo like Brussels sprouts and chili on pizza. Great! Thank you for the inspiration. I love the pizza toppings. yummy!!! I have never thought about putting brussels sprouts on a pizza before, but now that you’ve brought it up it make so much sense! I am definitely putting brussels sprouts on my next pizza! Yay! Definitely let me know how you liked it and share your recipe!